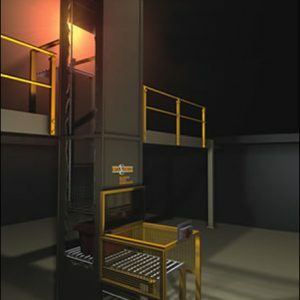 Unex Gravity Conveyor will keep your inventory moving smoothly and safely for a small investment. 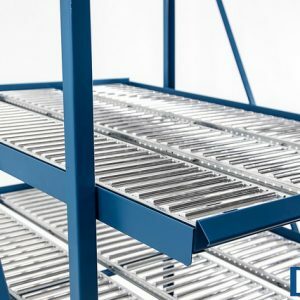 Unex Gravity Conveyor allows you to increase throughput and improve your warehouse systems effiency. 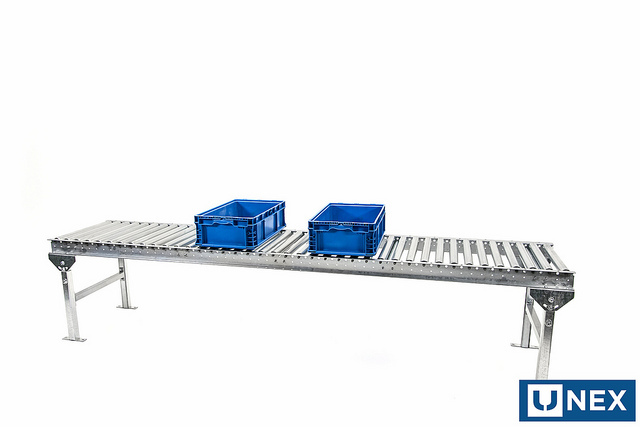 For a modest investment, the UNEX Gravity Conveyor can help your warehouse process different types of loads. UNEX manufactures gravity conveyor to order per each custom appilcation. 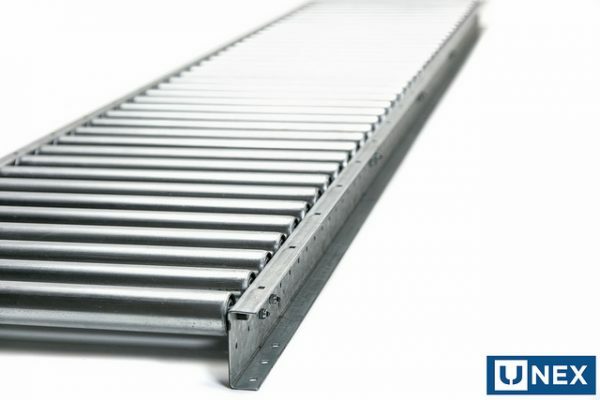 While most conveyors are sold in 5 or 10 foot lengths, UNEX manufactures Gravity Conveyor side channels to the inch. This allows you to order precisely what you need for your warehouse system. Save time and money by eliminating the need to saw cut sections to length. By only manufacturing what our customers request, we can provide more options. More options means better solutions. Maximum carton support provided by full width roller with ball bearings. Boxes track straighter with the help of the full width roller. Roller is available in two capacities. The JRS series is an 1.375? diameter roller with a 1/4? axle. The MRS series is a 1.9? roller with a 7/16? hex shaft for heavy duty applications. JRS is available in both steel or aluminum for both rollers and side channels. Skatewheel is constructed of a series of staggered aluminum or steel wheels. A variety of patterns are available. Skatewheel is also offered with both steel or aluminum side channels. 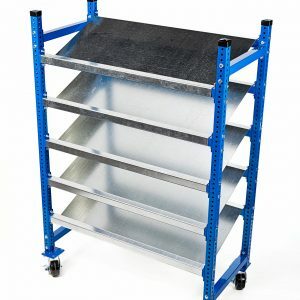 Wheel Rail consists of a narrow rail of single or double wheels for flowing well defined materials. To help convey irregular loads, the double wheel rails may be inline, or staggered. Ball Transfers are a multidirectional material handling solution that helps position material in the correct directional flow. If tight turns are a problem for your product, and curves aren’t an option, then Ball Transfers are a perfect solution. Robust and durable all steel construction. 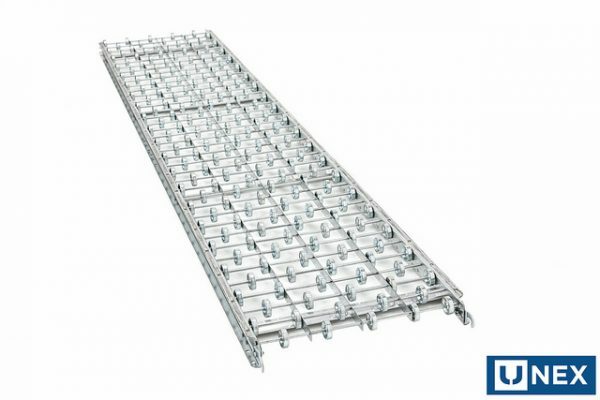 Our galvanized rollers and side channels are typically used for permanent installation. These are typically installed on adjustable H-supports. 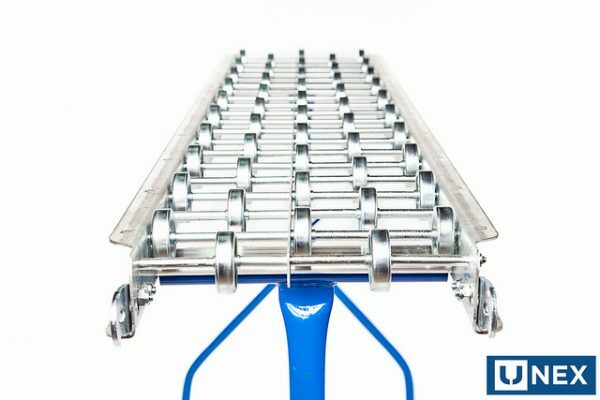 For increased portability, UNEX’s light duty Gravity Conveyor can be manufactured out of aluminum. Tripod stands can be used for instant, tool free setup. Available in multiple standard widths. Available in straight lengths up to 144. For tight turns, 45 and 90 degree curves available. Numerous spur options to suit custom layouts. Spring assisted and Manual personnel gates. Lengths can be manufactured “to the inch” for flexibility in almost any situation. Square cut ends for permanent installations are available. As well as notched ends for dropping onto beams, and coped ends for temporary hook and bar layouts. End treatments include impact plates, package stops, and hook and bars. Height adjustable H-Supports for permanent installation are available and manufactured from galvanized steel. Powdercoated Steel Tripod supports allow for temporary installs. Quick shipping Offered – guaranteed 72-hour turnaround on UNEX Gravity Conveyor in stock.